South Carolina certainly has the market cornered when it comes to unusual lighthouses. We’ve put together an Only In South Carolina signature road trip of the amazing lights in the Palmetto State. Prepare for a road trip that includes a lighthouse that’s shaped like a triangle and a light that’s basically a cast-iron monopole. The trip along the coast of South Carolina explores eight lighthouses, some upclose and others from afar. The total drive time is just over six hours and includes some of the most picturesque roads in the Lowcountry. Three of these lights, the first three, are only accessible by boat and we’ve given you the info you’ll need for the ferrys and services that take you to them. You can, of course, choose to skip those if time doesn’t allow. Here’s a link to the Google Map with all the locations you’ll need, in a pre-routed trip. Buckle up and enjoy this road trip through South Carolina! 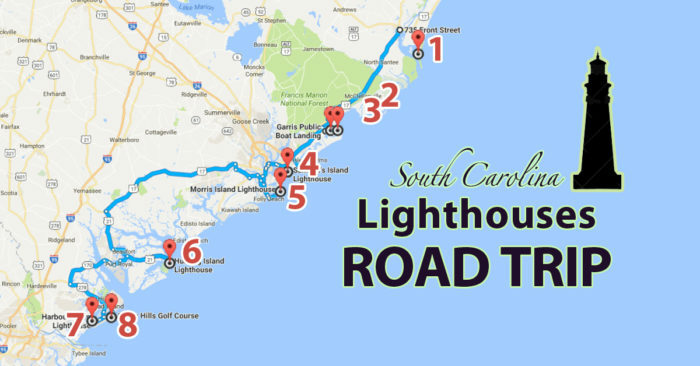 Our road trip starts with South Carolina's oldest light, first constructed in 1812. It's accessible by boat tour. There's a company, Rover Tours, located on Front Street in Georgetown that hosts regularly scheduled tours that depart from Georgetown. The Google Map marker on this road trip will take you to their location on Front Street. More information about departure dates, times and fees can be found here. Both of Cape Romain's lights are accessible only by boat. They're located side by side in the Cape Romain National Wildlife Refuge. Although the two lighthouses within this refuge are open for formal tours only four times a year, you can still motor by the island all year long and take as many pictures as your heart desires. You'll catch the Bulls Island Ferry for the chance to see these two lights. The schedule and fees are available on their website. You won't be able to see these two lights unless you take this ferry, so if there's no time, then skip to #4 on the road trip. The Bulls Island Ferry is located at 498 Bulls Island Road, Awendaw, South Carolina. The Google Maps location for #2 and #3 will take you to where the ferry departs. When the Charleston Light, located on Sullivan's Island, was originally lit in 1962 it was the second most powerful lighthouse in the Western Hemisphere. Standing 140-feet tall, this triangular-shaped lighthouse also has an unusual cap on the top. You'll find this popular lighthouse at 1815 Ion Ave, Sullivan's Island, SC 29482. Stranded alone at sea for at least a couple of decades, the Morris Island Light is one of the Lowcountry's most cherished icons. There's a group, called "SaveTheLight.org," that works tirelessly to save what's left of this beautiful solo warrior now standing alone in the water just off the north end of Folly Beach. You can see the light in person by driving to the end of East Ashley Avenue on Folly Beach and then taking the marked footpath to the beach. The Hunting Island Light is actually open for tours, with an occasional exception. This light is located within South Carolina's most traveled state park, Hunting Island State Park. The park has been closed since Hurrincane Matthew roared over the South Carolina coast in October 2016. However, according to the South Carolina State Parks' website, the park is set to reopen access on Friday October 28, 2016....just in time for your Lighthouse Road Trip! The Hunting Island Light is located at 2555 Sea Island Pkwy, St Helena Island, SC 29920. Next, you'll head over to Hilton Head Island to see the Harbour Town Light, a popular tourist attraction that's believed by many to be a real estate prop. But it does light up, as well as function as a navigational light for some local vessels. For a small fee you can usually go up inside the light to the observation tower for a long-range spectacular view. This light is located at 149 Lighthouse Rd, Hilton Head Island, SC 29928. We saw the oldest light house in the first stop of this fun road trip and now we'll see the most unusual lighthouse in the last stop. The Leamington Light, also called the Rear Range Light of Hilton Head Rear Range Light Station, is located on the 15th hole of the Arthur Hills Golf Course in a gated community. But reports are that you can tell the gate you're there to photograph the lighthouse and they'll let you pass. It's a community agreement or something to grant open access to this historic light. You'll definitely be intrigued by this unique structure. The address for the Leamington Lighthouse is 57 Leamington Ln, Hilton Head Island, SC 29928. Gas up the car and hit the road. This is one road trip you don’t want to miss! You’ll travel over some of the most beautiful Lowcountry roads lined with huge oak trees and hanging Spanish moss. And you’ll see the amazing and unique lights of South Carolina.